We know that many of our alumni continue to live within easy travelling distance of the University after graduating. Because of this we want to make sure that you have access to a range of facilities and can still enjoy ‘campus life’. Hertfordshire Sports Village - With the latest fitness equipment and technology coupled with highly experienced staff members, their facilities are the perfect place to spend your precious leisure time. And with a very competitive alumni discount, what are you waiting for? Single: £42 - valid with a UH alumni card only. A saving of up to 39% on your first month! Please email the membership team to sign up. 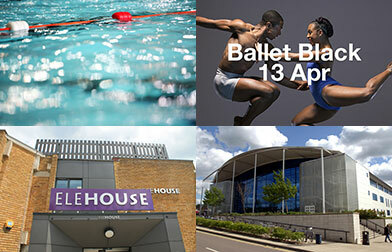 UHArts (University of Hertfordshire Arts) - Brings a rich arts and culture programme to the campus and local communities. They share the best visual arts, live arts, music, film, design and media across our University sites, in Hatfield and St Albans. Visit their website to see what's on and to get your 20% Alumni concession on your booking. LRCs – Did you know you are still able to use the fantastic LRCs on de Havilland and College Lane. Whilst we aren’t able to offer loan access for books there’s still plenty that you can do and it acts as a perfect environment for further study or any work based projects. More about Alumni use of the LRC. Club de Havilland and EleHouse – Coming back on campus to meet up with friends? Get 10% off your meal at the Ele House or Club de Havilland when you show your Alumni Card! More about getting an Alumni Card. Bodybalance - Physiotherapy and Sports Injury Clinic - Specialists in sports injuries, their team of highly skilled and experienced clinicians understand your needs and have the knowledge to help you manage your injury, reduce your pain and return you to your optimal level of activity. They can also help you with all kinds of injuries including back pain, neck pain, muscle strains, ligament sprains and tendon pains; and offer post-op rehabilitation. To find out more and access the 15% Alumni discount visit their website.